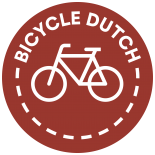 Cycling is taken into account when the Dutch undertake large infrastructure projects. Nijmegen now has a third bridge over the river Waal and it has a smooth wide cycle path. The bridge is named ‘The Crossing’ (De Oversteek) after a heroic military action in World War II and it was opened on 24 November 2013. The river Waal formed the north border of the city for 2000 years, but that is now changing. Nijmegen’s first bridge was the 1879 railway bridge. In 1936 the first traffic bridge was completed. Both these bridges can also be used for cycling. In the case of the railway bridge on the now 10-year-old cycle bridge attached to it (the ‘Snelbinder’). This new third bridge is part of a much larger project, that involves water management and a large-scale city expansion north of the river in the former village of Lent. 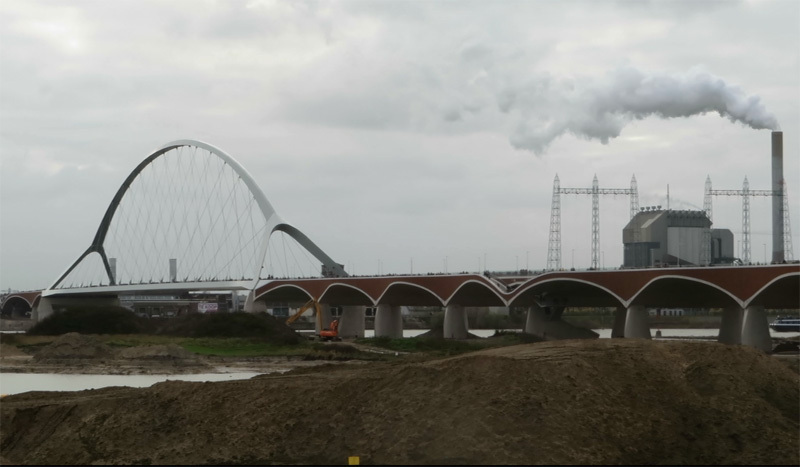 The new bridge in Nijmegen crossing the river Waal and its enlarged flood plains. As a measure to prevent flooding, the government of The Netherlands is changing the course of the river Waal at Nijmegen. The Nijmegen project is in itself again also part of a much larger project called ‘Room for the River’ in which more than 30 rivers throughout the country are being altered. The project ‘Room for the River’ at Nijmegen explained. Notice the original motor traffic bridge to the right, the central railway bridge and the new bridge to the left. The river flows from east to west (right to left). At Nijmegen, the river Waal makes a sharp bend that forms a bottleneck. In 1993 and again in 1995 this caused severe floods. To prevent that from happening again, the dike north of the Waal was moved 350 metres inland. In the thus enlarged flood plains an extra channel will be dug that will normally not be needed for the main flow of the river. But, in the case of high water levels, surplus water can flow to this artificial second river branch. It effectively doubles the size of the river bed. The land in between the original river and the extra channel will form an artificial island. Under normal water level conditions the flood plain area can also be used for recreation and as a nature reserve. Several new bridges will have to be built to reach the new island. The project is now in the stage that the channel excavation has started. 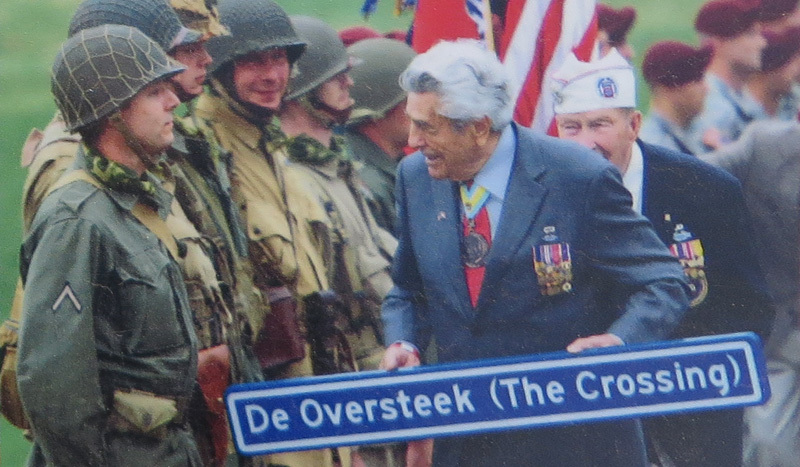 The two US veterans who made the original crossing in World War II celebrate the new bridge that was named in honour of their military action. The new traffic bridge was built at the location of the river crossing in World War II, by the American soldiers from the 504th Parachute Infantry Regiment attached to the 82nd Airborne Division on 20 September 1944. This heroic crossing heralded the liberation of Nijmegen. To commemorate that event, the bridge got its name ‘The Crossing’ (De Oversteek). Two veterans were present when the bridge was opened, as well as some relatives of the 48 men who were killed in this military action. To honour these men who gave their lives for the liberation of Nijmegen, the bridge has 48 double light fixtures. These lights are lit up slowly one by one from south to north every night. A symbolic recreation of the crossing in a work of art of lights. The lighting sequence of these 48 lights is clearly visible in a time-lapse video of the opening night. At the request of the city of Nijmegen the new bridge was designed by Belgian architect Chris Poulissen and engineer Laurent Ney from Luxembourg. “The city of Nijmegen formulated the specification of the bridge in a document outlining their ambitions. Within this, design criteria were laid down which helped to set out the project. A first issue concerns the placement within the surroundings. The urban bridge has to form an integral part of the riverscape, and be both seen and experienced from the banks as well as from the bridge itself. 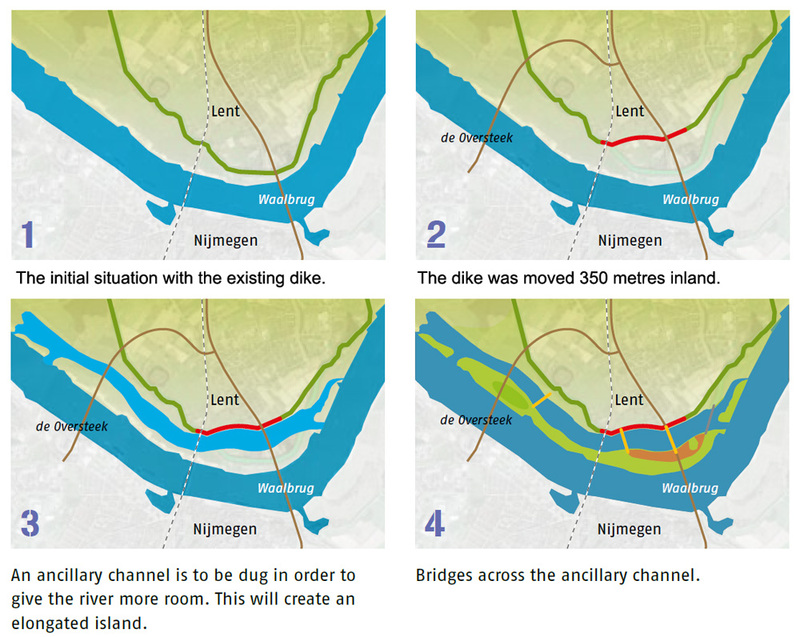 A second criterion requires the design to be consistent with the existing and future image of Nijmegen in terms of the relocation of the dyke and the spatial developments around the Waal River. This means that the main construction has to stand in relationship to the whole programme and function in an ideal way as a major piece of traffic infrastructure. A third ambition describes the bridge as a work of art that, in a single gesture, articulates contemporary technology and design. The fourth criterion focuses on the function and experiential value of the bridge: the urban bridge should create an ‘urban plaza’, both on deck and at ground level, as well as a pleasant environment underneath. Total length of bridge, approach spans and ramps is about 1.6 km (1 mile). There is a wide two-way cycle path on the east side of the bridge. The two-way cycle track is shielded from the motor traffic lanes by a glass wall that also stops sound of the motor traffic and wind. That this cycle path must also be used by pedestrians is one of the main criticisms of the bridge. And you could think that the architects – who are not Dutch after all – did not understand the importance of cycling in the Netherlands. But that would be an unfair judgement as it may have to do with money reserved for this project, rather than with their ideas. The same architects also designed ‘Het Groentje’ and that is perfect. The bridge also has recreational functions but for all the different activities the cycle track (with its resting areas) is considered by some to be a bit on the narrow side. The Nijmegen branch of the Cyclists’ Union has also some remarks and they involve the embedding of the bridge in its surroundings. The new island can only be reached by using stairs and that cannot be called cycle friendly. 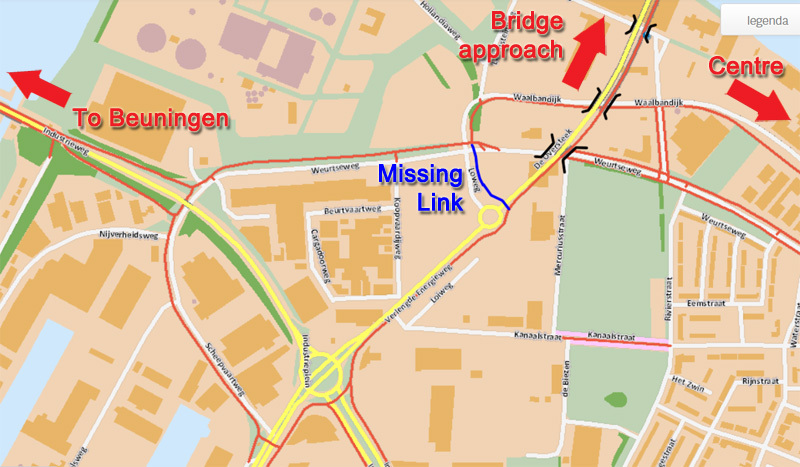 There is also no cycle friendly connection from the new high-speed cycle route Nijmegen to Beuningen that passes under the south approach span to the bridge itself. Very odd, considering both bridge and cycle route are new and should have had a connection. The turbo roundabout at the south end of the bridge approach cannot be crossed by people cycling wanting to go west. If they do want to go west they either have to use one of the stairs or make a very long detour to cross the road much further south. 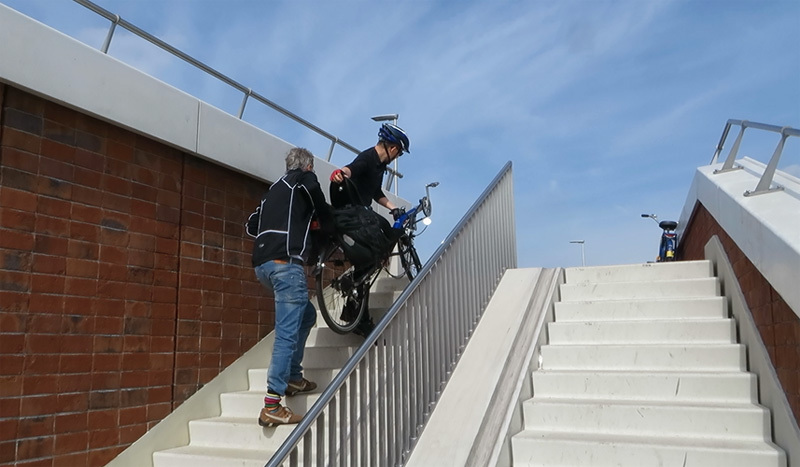 These stairs may be usable for a fit cyclist with an ordinary bicycle. But I filmed two men carrying a recumbent up the stairs and it is obvious that you could never do that on your own. This will also pose problems for school children, the elderly and people in a bakfiets. Two men carry a recumbent up the stairs from the artificial island to the bridge. It is clear that these stairs cannot be used easily by everyone. Jac Splinter uploaded a video to YouTube to show how badly accessible the surrounding infrastructure is for pedestrians and people cycling. He loathes the city council’s inability to make the bridge easily accessible for other traffic than motor traffic: “They had 10 years to think about routes and they didn’t even come up with a few necessary signs. For motor traffic there are over 70 signs, but I stopped counting to be honest” Jac says in his video called ‘Car thinking’. The bridge is also supposed to be used by people as a recreational site in itself. The bridge therefore has a couple of wider areas with white concrete benches for people to sit on and watch the river landscape. But when these people arrive by bicycle there is no real space to park their bicycles. There is also no real designated space for people to walk the bridge. The cycle path has to be used by people walking, apart from some areas where there is a single white line separating the cycle track and the pedestrians. But I was told this white line was more meant to prevent cyclists from cycling too close to the edge of the bridge, because in that case they might hit their heads to the wires holding up the deck. But these are all complaints made in a country that is used to very high standards of cycling infrastructure. See for yourself what the bridge looks like in the two videos to go with this post. One to show the bridge itself and one view from the saddle riding over it from south to north. A portait of the Nijmegen bridge ‘The Crossing’ (De Oversteek). A ride on the Nijmegen bridge ‘The Crossing’ (De Oversteek). This bridge became one of ten ‘relatively unknown bridges of exceptional design’ featured on a series of stamps issued by PostNL. This bridge can now also be seen on a stamp issued on 30 March 2015. All of your excellent cycling video’s have inspired me to upload my own two videos about the construction of a cycle path near me. It was shot on my phone, so it’s not the same high quality, but seeing the works going on I thought it might be interesting anyway. By the way, be sure to switch on subtitles for explanations! That’s great work Koen! And these videos deserve more attention than being hidden in the comment section of an unrelated blog post. So I created an extra blog post with your videos just now. Such a cool design! I love it. I was here with Mark in April and I wanted to share my photos and one impression of the visit to De Oversteek. The glass partition between the vehicle lanes and the bike path is incredible; it does an amazing job at reducing automobile noise. This entry was posted on 29 May 2014 by Bicycle Dutch in Original posts and tagged big bridge, exceptional cycling infrastructure, Nijmegen.